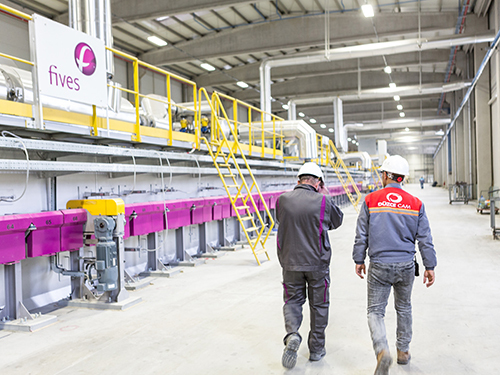 Fives, well-known in the design and supply of equipment for glass production, is proud to announce the successful start-up of a new complete float glass line with a melting capacity of 800t/day to produce a glass thickness from 3mm to 10mm for the Turkish glassmaker Düzce Cam. The start-up took place as planned on 15 November in the presence of our customer, our commissioning teams and suppliers at Düzce site, some 220 km from Istanbul. The major asset of this new float glass line is Fives proprietary furnace technology with ultra-low energy consumption Prium® Melt Float L.E.M.® (Low Energy Melter). Thanks to its geometry, the furnace makes it possible to save up to 20% energy compared to conventional technologies. The furnace is also equipped with a comprehensive digital control system and a smart software for production optimization providing a comprehensive vision of the glassmaking process. Thanks to all these features and technologies, Fives confirms its position as a preferred partner for newcomers in glass. Three years only after its successful entry into float glass production, Düzce Cam is now ready to embark on a major expansion. The first float glass line of 600 t/day was already supplied by Fives Stein in 2010.